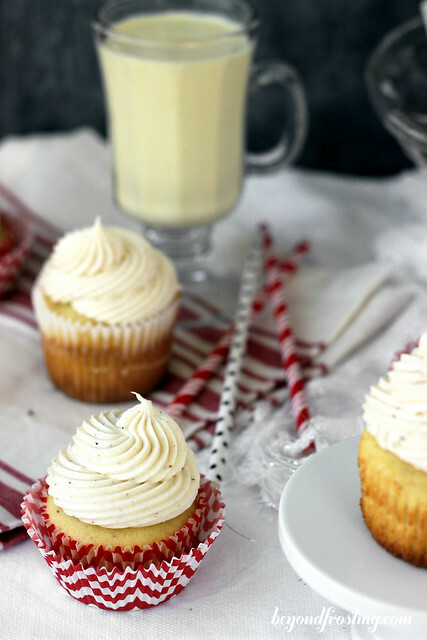 I couldn’t think of a better holiday cupcake than a golden yellow Eggnog Cupcake spiked with rum and topped with a creamy eggnog buttercream. Can you believe Christmas is umm 3 days away?! All of the sudden I blinked and December is just about over. We enjoyed a nice weekend with my boyfriend’s family for their Christmas celebration and then I attended a bridal shower yesterday. I felt like I was counting all my blessings all weekend. I really lucked out that my boyfriend’s family is so welcoming and supportive. I baked my Cranberry Orange Pound Cake for the party, and his grandmother made a little sign that she put on the cake that said “Better Homes and Gardens First Place Winner”. I am so lucky to be able to be surrounded by his family who has always welcomed me with open arms. I am not sure if it’s just me, or the fact that I always bring their favorite Rum Cake. Christmas will be over before you know it, so you better stock up on your Eggnog now! 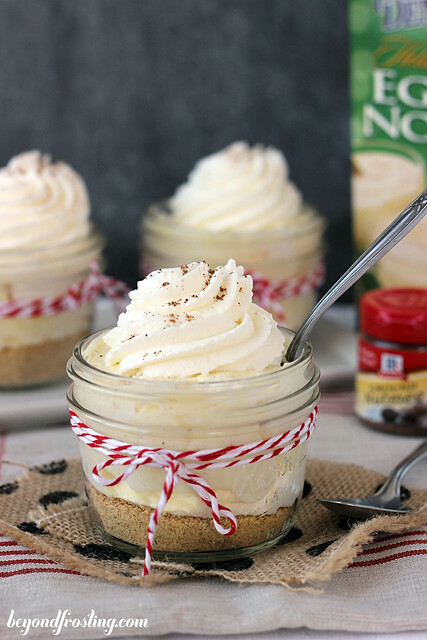 I’m not done sharing eggnog recipes yet! 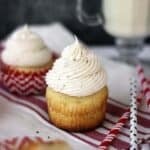 These Spiced Rum and Eggnog Cupcakes with Eggnog Buttercream need to be on your holiday dessert table! 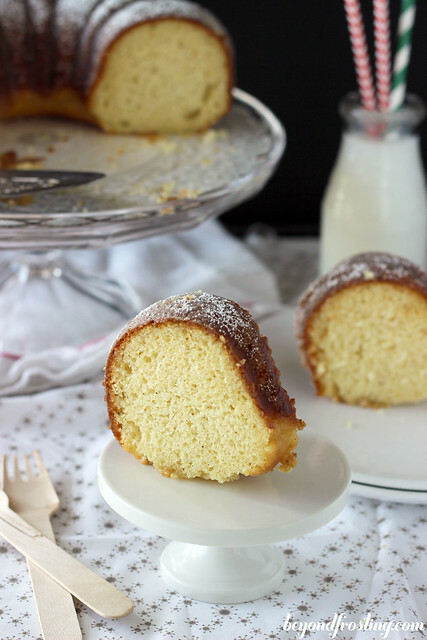 My friend Rachel shared her super easy Rum Cake with me which is my boyfriend’s family’s favorite cake! 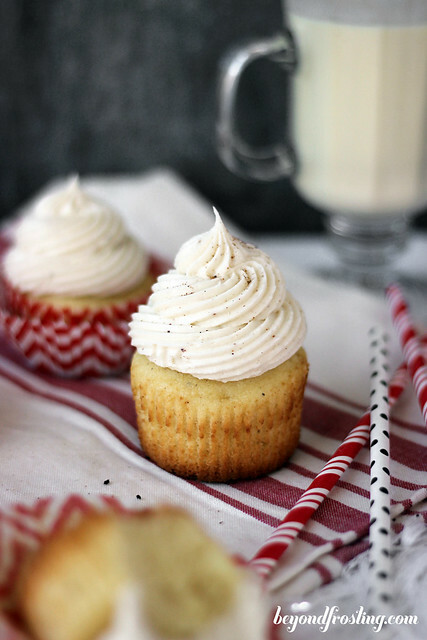 Rachel’s recipe uses a cake mix, so I wanted to try making a homemade spiced rum cupcake and add a twist of eggnog. I received a copy of the Better Homes and Gardens 15th Edition Cookbook and I immediately flipped to each of the dessert sections to see what was new. 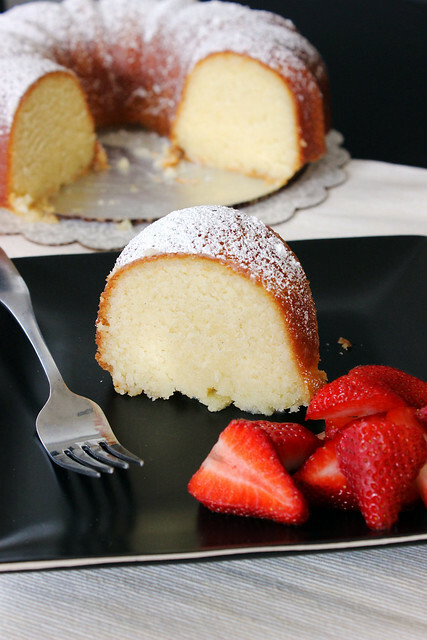 This recipe is adapted from their yellow cake. I have added some spices and swapped out the water for rum and eggnog. 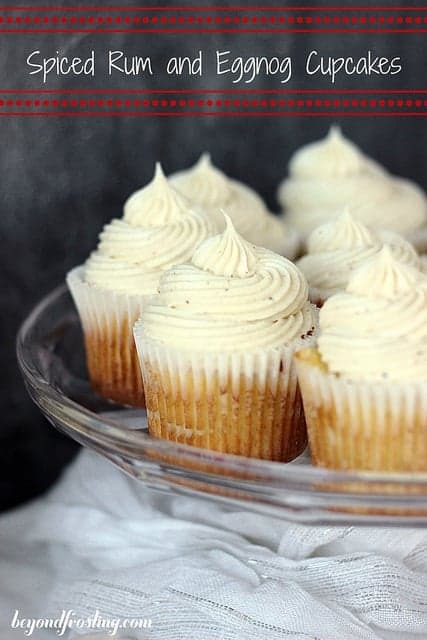 I also decided to add some sour cream to this recipe because sour cream keeps cupcakes extra moist. 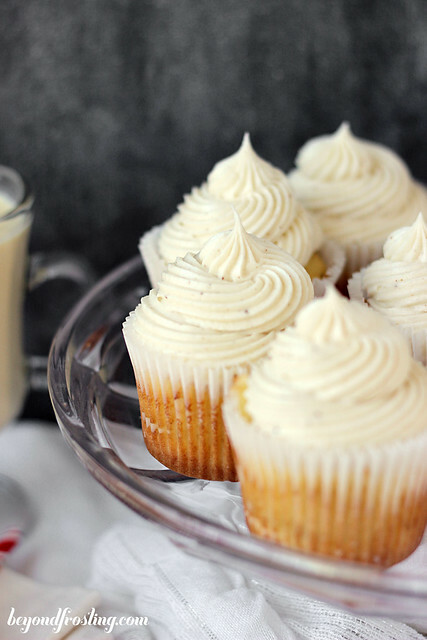 Adding the sour cream into the batter means that the batter must be very well mixed so that it is evenly distributed, otherwise some of your cupcakes might not bake up evenly. I always use a light sour cream instead of full fat. 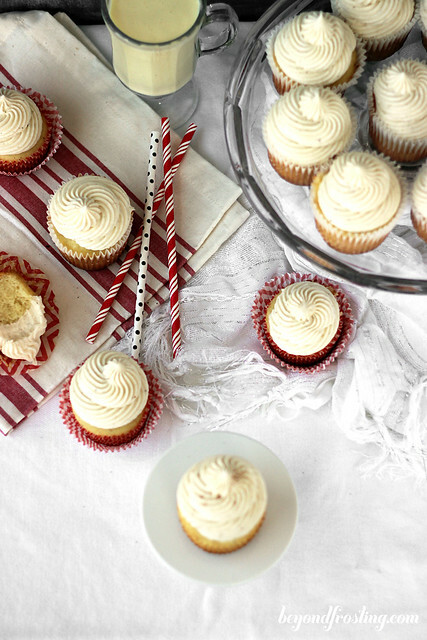 The frosting on these cupcakes is an Eggnog Buttercream, which is one of my holiday favorites. 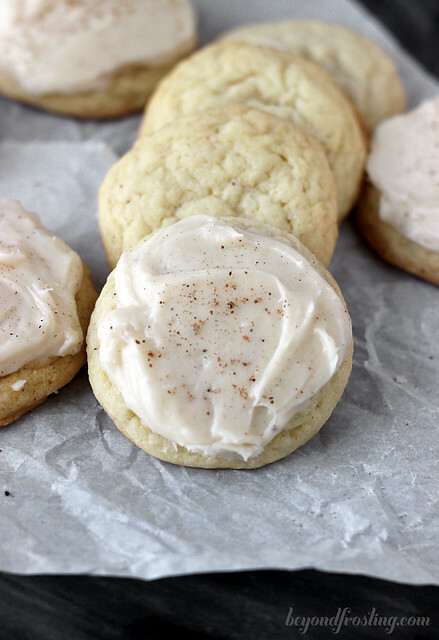 I used the same buttercream for these Melt in Your Mouth Eggnog Cookies. I make most of my frosting recipes using heavy cream, but for this buttercream, I swapped in eggnog instead. There is a lot of butter in this frosting, but that is because I like my cupcakes with a big swirl of frosting. This would also be enough frosting for a cake as well! 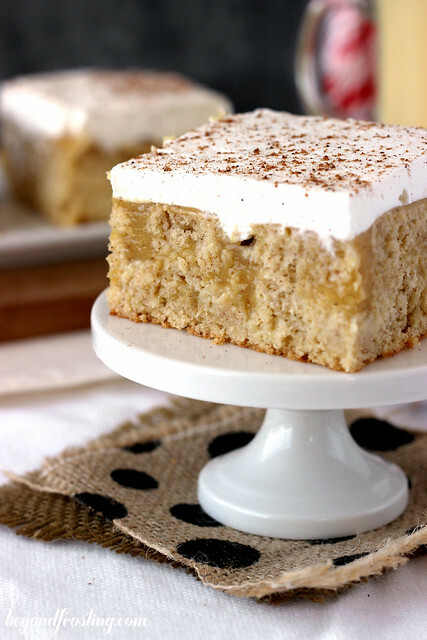 If you are looking to kick this up a notch, you might consider adding a splash of rum to the frosting as well! 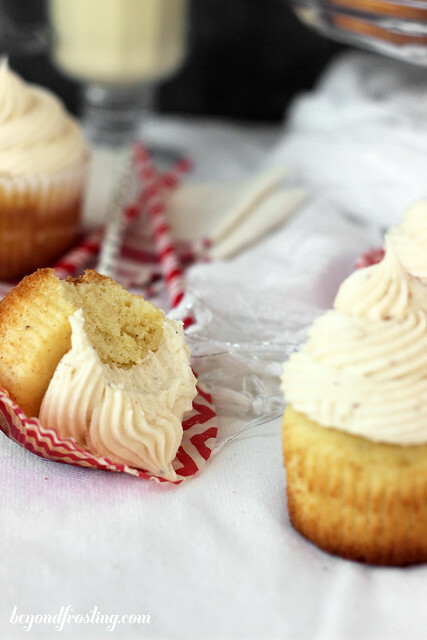 Either way, this buttercream will knock your socks off! Keep up with all the happenings. Subscribe at the end of this post. Remove butter from fridge and allow to come to room temperature, or soften in the microwave for 15 seconds. Combine softened butter with sugar and beat on medium speed until light and fluffy. Add eggs, one at a time, ensuring that each egg is well beaten. Scrape down the sides of the bowl if necessary. In a separate bowl, combine flour, baking powder, nutmeg and salt. Stir to combine. Add half the flour mixture followed by the rum and turn mixer on low speed, beating just until combined. Pour in remaining flour, eggnog and sour cream. Beat on medium speed until well combined. Divide batter evenly among lined cupcake pan, filling each cup about 2/3 full. Bake at 375° F for 14-16 minutes. Test cupcakes for doneness by inserting a toothpick into the cupcake. If the toothpick comes out clean, the cupcakes are finished. Allow to cool completely. Using a stand mixer, beat the butter for several minutes until light and fluffy. Add powdered sugar one cup at a time and slowly increase speed from low to medium. As the frosting becomes thicker, slowly add eggnog and slowly increase speed to medium-high; beat for several minutes until light and fluffy. Add nutmeg at any point. Pipe onto cooled cupcakes and sprinkle with additional nutmeg. Does the frosting need to be refrigerated or is it shelf stable? Hi Leah, I did not refrigerate these but I also served them the day or two after I made them. Climate effects this though, so you would need to do what’s best for the climate you live in. If you live in warm temperatures, it’s probably best to refrigerate. Or sometimes I just make the buttercream before serving but make the cupcakes in advance. These look great, how many cupcakes does this recipe make though ? Hi Amanda, it should make between 20-24 depending on how full you make them.